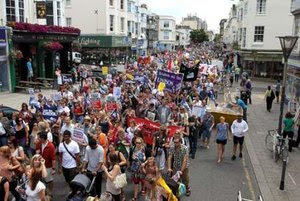 Today, Brighton, Hastings and Eastbourne will all host demonstrations by thousands of public sector workers who are refusing to buckle to the will of a Tory government. If the government's determination to carry out a money-grab under the guise of pension reform - and toss it into the bottomless deficit pit caused by bailing out the banks to the tune of £124 billion - has not persuaded every public sector worker that they are being picked on, then Osborne's autumn statement yesterday must have. On the eve of the biggest strike in a generation, the announcement that public sector pay rises will be capped to 1% for two years, after the current two-year pay freeze ends, is tantamount to a government goading the very people who form the backbone of the country: the nurses, teachers and council workers who provide the services that define a civilised nation. Coupled with the announcement, in the same statement, that public sector job losses over the next five years are to increase from 400,000 to 710,000, public sector workers can be in no doubt how valued they are by the current government. Three-quarters of public sector workers are women and they also form the majority of low paid workers - in any sector – entitled to tax credits. Yesterday’s announcement that the planned increase in child tax credits is to be cut is further proof that the lowest paid and most vulnerable in society are under attack. A bunch of smirking, public school-educated men are taking a sledgehammer to the country on the basis of the votes of 22% of the electorate; and they are being supported by treacherous Liberal Democrats who should hang their heads in shame at being complicit in this Vichy government. Like dogs allowed on the sofa, Clegg and Alexander sat smugly on the front bench yesterday, nodding their heads as the heir to a baronetcy and the Osborne & Little wallpaper fortune declared class war. It's like Thatcher's 'enemy within' all over again...they are spoiling for a fight. So, let's give them one; let's stand up for ourselves and each other by getting out onto the streets of Sussex today - we wunt be druv!